One of the first tips I learned about working with kale for a salad, is to massage the leaves. Rubbing the leaves under cold water as you wash them will make the kale more tender. This idea along with the addition of quinoa, made me feel more at ease about that rough texture kale is known for. The quinoa has double duty. It adds protein to the salad so that it is filling and can be eaten as a healthy vegetarian light lunch or dinner, but it also helps create a layer of tenderness and contrasting texture. The remaining ingredients in this salad are at your discretion. I used traditional Greek salad components such as feta cheese, cucumber, tomato (though I opted for grape ones), and red onion. I strayed a bit by adding mixed green olives instead of Kalamata and went with orange bell pepper instead of green. I also used a lemon vinaigrette versus a Greek dressing because I felt it paired better with the kale. 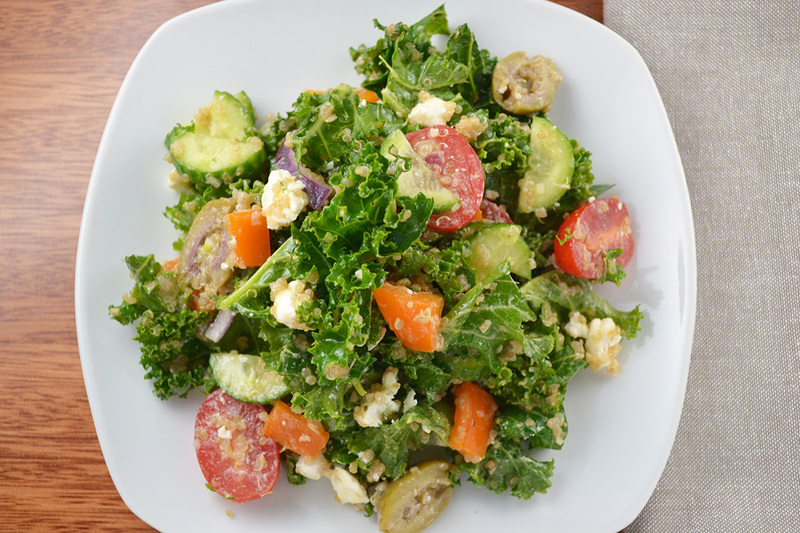 If you haven’t tried kale in a salad, I encourage you to give it a go with this Greek version. Between the crunchy fresh vegetables, creamy cheese, and savory cooked quinoa, the multitude of flavors will make you forget you are enjoying that famous almighty healthy kale. Massage kale under cold water by rubbing leaves together. Dry thoroughly. Place kale in a large bowl and toss with cooked quinoa. Add sliced cucumbers, tomatoes, olives, diced bell pepper, sliced onion, and feta cheese. Toss well. In a small bowl, whisk together lemon juice and mustard. Add olive oil, a little at a time, whisking thoroughly to emulsify. Season with salt and pepper to taste. Pour over kale salad and toss to coat. Serve immediately.